Everyday you and I have the opportunity to make somebody’s day better or worse. We have the opportunity to lift someone up or tear them down. We have the opportunity to put a smile on their face or to make them doubt and question and frown. It's all about the words that we speak. Every human being carries so much power in their words. 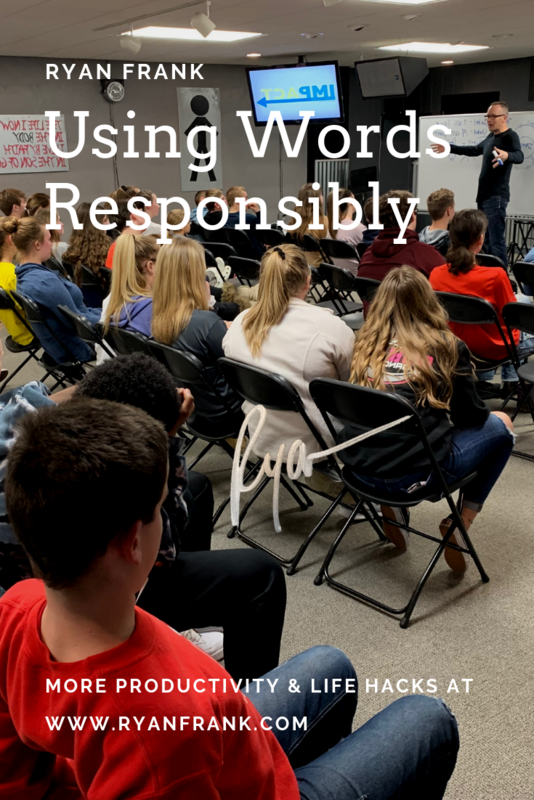 Let me tell you something; if you're a leader, if you're a manager, if you own a business, if you’re pastor, if you're a teacher, if you're a parent, if you're a spouse and you are leading people, your words are even more powerful. Why? Because you’ve got people watching you. They are watching, they are listening, and they hang on to sometimes literally every word you speak! When's the last time you really stopped to think about your words; what am I saying and how am I saying it? Your words carry power. There are three questions I want to share with you today and I would love it if these three questions would be a filter in my mind and yours every time I speak. I know it's not always going to be possible. We are human and we forget what's important, but I'm telling you if you can get these three questions down right, it would change the way you communicate, it would change your perspective, and it would make a huge difference in the lives of those that you speak to. Question number one: Is what I am saying true? Stop and think about it; we rattle stuff off and don't always think about whether it's true or not. But, if I ask myself in my mind if I had a filter, before I speak this, I want to make sure it is true. That would make a huge difference. There is so much untruth spoken and all it does is cause problems. Question number two: Is it necessary that I say this? We are often good at pontificating and throwing out our point of view and our two cents worth and arguing over this and making a mountain out of a molehill. We say things that just aren't necessary. What would happen if every word went through the filter of is this necessary, is it true? Question number three: Is this kind? You know the world just needs a little bit more kindness. I think there's a song with those lyrics. We just need a little more kindness and everyday your words are like a hammer. A hammer can be used to build things, but you can also use a hammer to tear things down. Your words can be used to build people up or to tear them down. Are my words kind? What would happen if you just chose to speak kindness to those around you and chose not to verbalize those unkind words that you may be tempted to throw out? Is this true, is this necessary, and is this kind? If you can learn to filter your communication through those three sentences, it will change the culture of your office, it will change the culture of your ministry, it will change the culture of your home, and all of a sudden, you’ll find people are a lot more apt to listen to you and to be around you and there will be a new gravitational pull in your life. Instead of people wanting to run the other way, they are attracted to you simply because of the words you say. My words should bring life and your words should bring life. If we will process everything we say through the framework of is it true, is it necessary, and is it kind, words of life will flow, our influence will grow, and God will be able to use us to do much more than we’ve ever been used before. Remember those three questions today- is it true, is it necessary, is it kind!